"My friend invented this recipe and it was so fantastic I had to share! The flavor is incredible!" About 2 minutes before burgers are done, place slices of ciabatta bread onto the grill to toast, about 1 minute per side. About 1 minute before the burgers are done, top each burger with a slice of Cheddar cheese, and let melt. Serve chicken burgers on the toasted ciabatta bread, topped with about 1 tablespoon of salsa and about 1 tablespoon of the reserved chopped cilantro. 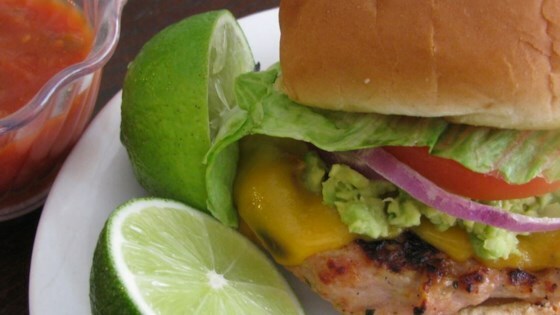 Put a healthy and delicious turn on typical grilled burgers. these were pretty good, but not spectacular... the chicken needs more seasoning in my opinion. will make again, just add something more.